I've got another fic that I am in love with and I want to share it with all of you. This story came to me as a beta. I have worked on the author's previous stories and was so happy to hear that she was starting a new one and asked me to be her beta. If you've read my bio, you know that I am really an E/B story lover, with a few exceptions. And this story is the epitome of my ideal. 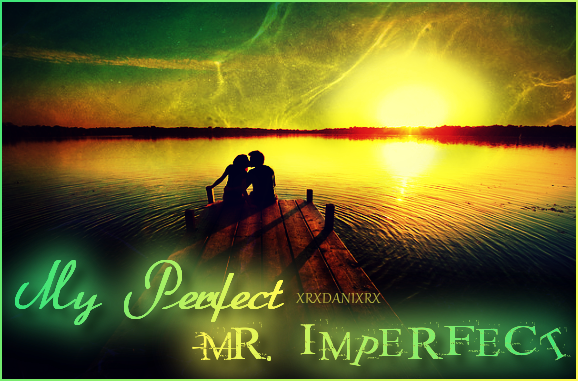 My Perfect Mr Imperfect by xrxdanixrx is one of my top 5 fics right now. First of all, she is a fabulously detailed writer. It's not all about lemons - it's a story. She builds up to that. There is an undeniable, strong, realistic substance to her fics. I will get to her others later, because trust me, you will want to read them all. In MPMI, Bella works for a successful auction house and is in love with her boss....Jasper. I know, I know...it's not Edward, but sit tight. Good things come to those who wait. Her and Jasper have cooled off...though the hope is still there for her. She meets the disheveled, flannel wearing, scruffy friend of Jasper who is a new client of their business. He's not her type at all...yet, there is something there. The story is so smooth and concise. It is full of the perfect ratio of angst, drama, happiness to keep you wanting more. You want to love/shake/squeeze/lock them in a room all at the same time. It's a satisfying story of finding a new love, stepping outside the box...letting go and trying to trust your emotions. Dani is a wonderful author that weaves a tightly knit, perfectly paced story of self discovery, finding true love and determination to fight for what you want. The past may have a hold on you, but if you find that special someone, can they make the future better? You'll know if you read it. This story is not complete, but trust me...you need to read it. Give yourself something to look forward to each week as she updates regularly (I know this for a fact). Give it a read...I've never steered you wrong and I certainly wouldn't start now. Find out how love can find you in the most Imperfect situation. Well fucksakes, now I MUST read this story. Just the thought of her being all for Jasper and then falling for Edward makes my stomach fill with butterflies!